I recently had an afternoon planned of walking around the Italian Market in Philadelphia and stopping at one of my favorite beer spots, Memphis Taproom for a beer and a bite to eat. However, prior to leaving for the city I realized Devil’s Den was only 2 blocks from the Market and since it had been a few years since I last was at the Den I altered my plans and went there instead of Memphis. One of the things that I remember from my last visit to the Den that was so appealing was the great beer list and the relaxing atmosphere. Things this time were a bit different. When I originally planned the day I was aware that is was the same day as the Philly Craft Beer Express but made sure Memphis Taproom was not one of the stops. However, when I changed my plans last minute I didn’t think to check if Devil’s Den was one of stops on the Express and it was. When my companion and I arrived the place was packed and noisy. 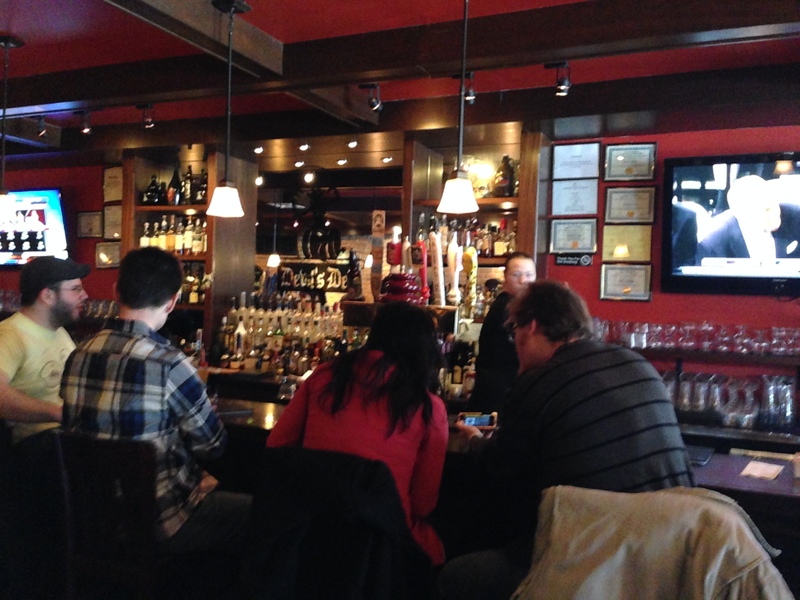 We made our way through the bar area crowd and requested a table in the small dining room. Fortunately, there were two tables open and we got one of them. I wasn’t sure how the service would be with such a crowd but no worries the staff did an outstanding job of taking care of everyone. Now that we were seated I looked forward to picking out my beer of choice. I asked our fabulous server, Dan P., if one could make a taster round but was informed they don’t offer that. Although, they do have 3 prefabbed tasting rounds on the menu. It disheartens me to have to admit I was a bit disappointed by the beer list on this particular visit. The list leaned very heavily towards IPA’s. I know folks like their hops but not everybody is a hop head and even hop heads like something else once in a while. I stand by them being on Geeky Beer Gal’s Philly Bar Crawl list because it was still a list of great beers I just would have preferred a bit more variety. Their bottle list is amazing and offers a wide variety. 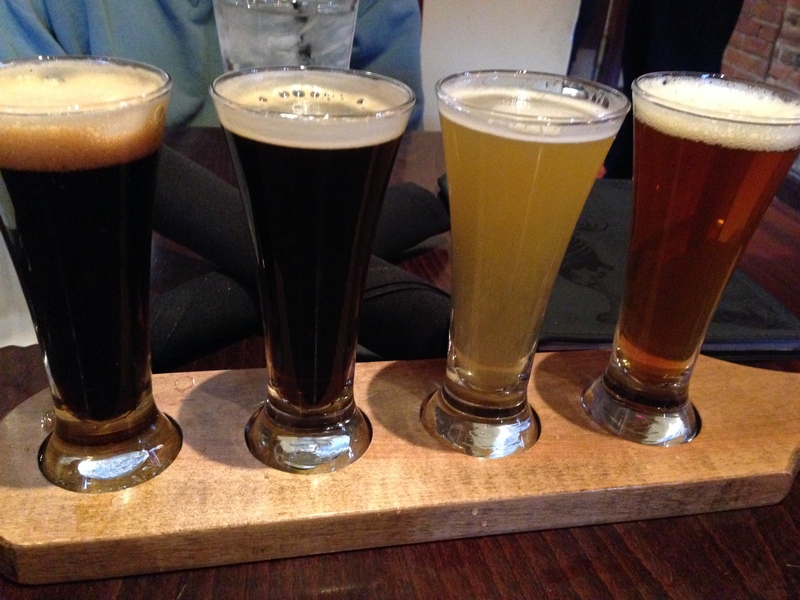 However, I was in the mood for a beer on tap and was having a hard time finding a beer I wanted a full pint of so I decided to go with one of the prefab flights. Each flight consisted of 4 beers and they offered a Sour Flight, Hops Flight (of course) and a Combo Flight. I enjoy a nice sour ale every now and then but didn’t feel in the mood for a full flight of sours and I knew I wasn’t going for a Hop flight so I settled for the Combo flight. It was made up of a cherry stout, a wheat and 2 IPA’s. I think for a Combo it would have been nice to replace one of the IPA’s with a sour and make it a true combo of styles. Once the beer was ordered we perused the food menu. We happened to be there on Saturday during brunch service so no ordering from the regular menu. 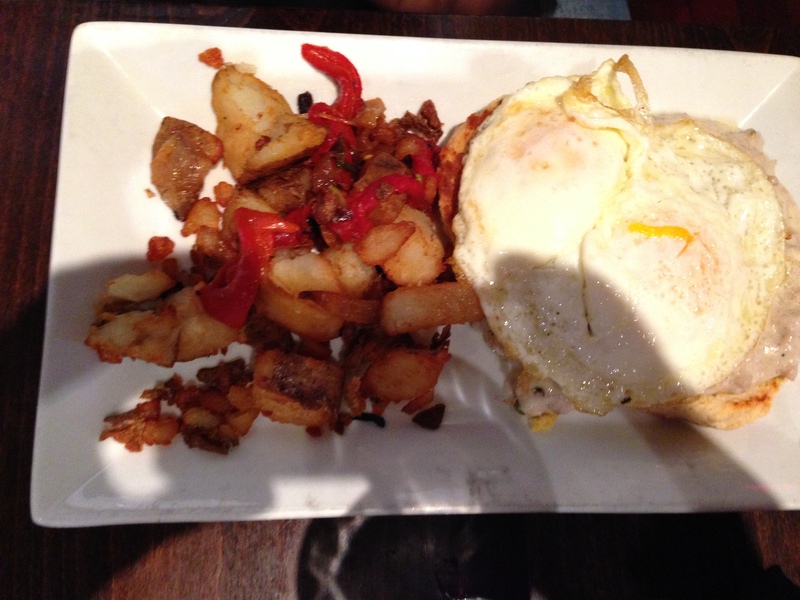 FYI – Brunch is a big thing on the weekend at Philly beer establishments. Both my companion and I felt this menu leaned heavily towards the breakfast side with lots of egg dishes and was a bit light on the lunch side of things but was both meat and vegetarian friendly. I ordered the house made Black Bean Burger – I love when an establishment offers a house made veggie burger rather serving up a dried out hockey pock patty that I could buy in the frozen section of any market. My companion ordered the Biscuits and Gravy. Both beer and the food arrived promptly which was incredible considering the crowd they were dealing with. (I cannot stress enough how stellar the service was) Both meals were a nice size and delish and the burger came with the choice of a side salad or fries. Another nice touch 2 different hot sauces were brought to the table. Options are always nice and one was my favorite hot sauce, Cholula. Of course, I was more excited about the BEER! Holy Hops this beer was packed with a hop punch. So much so that I had a bit of trouble tasting much else. There were undertones of citrus and pine along with all the hops. It pours a nice rich copper color with head of creamy green but left a cotton mouth feeling after drinking. This beer offers a nice combination of hops, roasted caramel and chocolate with a deep brown body and medium white head with just hints of green in it. The hops were subtle compared to the Armageddon but after drinking it for a bit the hops came more to the forefront. This is a nicely done Black IPA. More and more I’m learning to appreciate this style; a nice combination of hops and malts. This wheat ale was such an enjoyable beer, not just because it was something besides an IPA, but because it has that tart earthiness I’ve come to expect from a good wheat beer. It has a true wheat body, as well, that’s cloudy gold with a frothy head and complemented the vinaigrette on my side salad wonderfully with its combination of citrus, apricot and apples and the ever wonderful wheat ale grassiness. I enjoyed this one the most from my visit to the Den. By now I think most know that Geeky Beer Gal loves her STOUTS! I was hesitant to order a full pint of this one not knowing how strong the cherry flavor with be. I wasn’t in the mood for an overpowering fruit flavor with my meal. Turns out the cherry flavor is subtle and a full pint would have been just fine. Then again I wouldn’t have gotten to try the other 3 so it all worked out. It has a good roasted chicory taste to it with just slight undertones of the cherry. As far as stouts go it’s good but not great still an enjoyable Imperial Stout. I’m glad I finally got to return to Devil’s Den and would do so again but next time I would plan better and make sure I’m there when there’s not an event happening and the full menu is offered.